Are you nearsighted, farsighted, or do you have astigmatism? If you meet these basic criteria, you should schedule your LASIK exam, the medical field’s most comprehensive, 14-test diagnostic LASIK exam that takes approximately 2½ hours to complete. 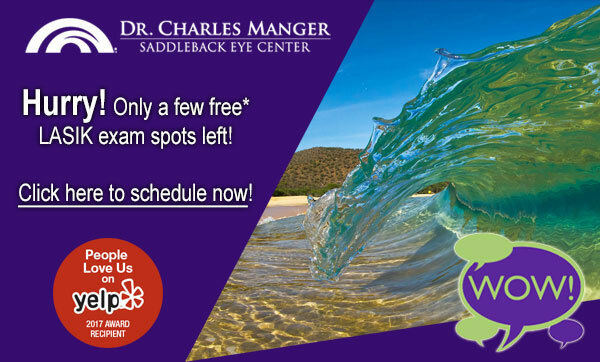 Don’t wait any longer to find out your LASIK eligibility — call us today at 877-351-3937 or schedule your free* LASIK exam online. Have you been told you are not a good candidate for LASIK? Because of improvements in technology and his extensive expertise, Dr. Manger can often treat patients who may have been turned down for LASIK in the past. In fact, half of the people who qualify for Dr. Manger’s All-Laser Custom LASIK have previously been told by their eye care professionals they could not have the procedure. Many times, eye doctors who do not perform LASIK surgery are not supportive of the procedure, and will tell patients that they are not good candidates for LASIK because they are farsighted, have astigmatism, need reading glasses, or because the eye doctor doesn’t want to lose them as a patient. If you have been wondering, “Can I get LASIK?”, schedule your free* LASIK exam today to find out if LASIK is right for you. Your struggle with glasses and contacts may soon be over!